On Sale! Nice Bay Black Female! Etch your favorite alpaca in marble! Now breeding!! Skyward has produced his first crias...and would like some more dates! Skyward took 2nd at competitive Empire Extravaganza! Then 4th at Green Mt. at age 1yr. 3 days in a VERY competitive Fawn class of much older competitors! Jude Anderson raved about him "holding his own against much, much older boys…with his strong frame, fabulous coverage and dense, consistent fleece" MFI Peruvian Wellington and Lady Sofia hit a home run with this boy! Skyward is a gorgeous male…covered in INCREDIBLE medium fawn fleece. Daughter of Captain Nemo and High Peaks’ Rosetta, “Cassie” is a strong, fun loving beauty of a solid DRG girl with the best her sire and dam have to give! 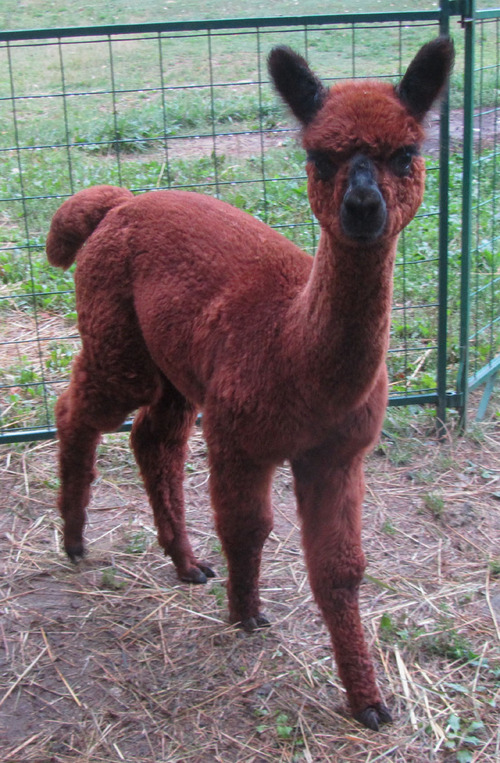 A gorgeous and sweet alpaca, with fantastic gray genetics! 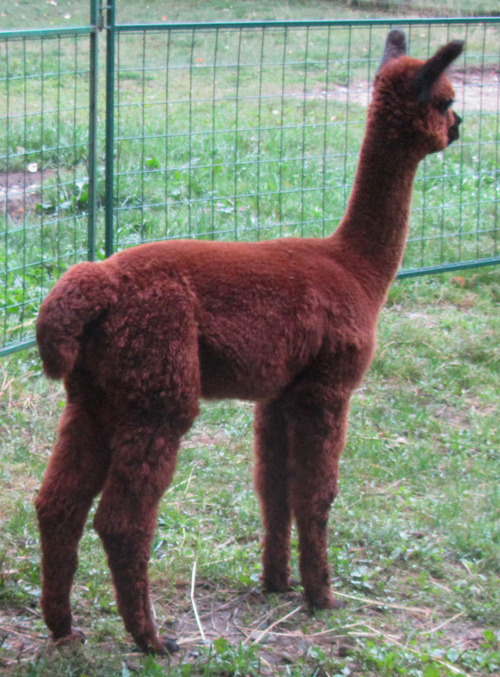 Cassie and High Peaks Skyward produced a beautiful solid maroon female cria in the summer of 2012 - "Poppy Rose". Cassie has proven to a wonderful and caring mother. Cassie comes with 2 breedings to any Mountain Meadows herdsire! Mountain Meadows Poppy Rose is an absolutely gorgeous maroon female! Her fleece is fine and a fabulous red-brown! Poppy had a beautiful dark girl with tight crimp out of High Peaks Reveille in August, 2015, and she's proven to be a wonderful dam. Poppy comes with 2 breedings to any Mtn Meadows Farm herdsire! All sales $10,000 or less: 50% down, 50% balance financed for one year from date of contract..interest free. All sales over $10,000: 50% down,balance financed over two years at no interest. Longer financing available in some cases. All sales over $10,000 include free transport to any farm in US. For sales less than $10,000, purchaser is responsible for transport to their farm. Free boarding for any purchased female for up to 6 months. Other terms possible... we are happy to work with you to make financing your purchase as convenient as possible.